Bay Area composer Gabriela Lena Frank sets to music a text describing artist Frida Kahlo returning as a ghost for one last visit with her beloved husband Diego Rivera during the Dia de los Muertos festival. Mahler always wanted to compose an opera but was in such demand as a conductor that he never found the time. His songs are the closest he came to realizing his dream. With its instantly recognizable opening, Beethoven’s Fifth Symphony is one of the best-known and most popular pieces of classical music ever written. The Creatures of Prometheus (German: Die Geschöpfe des Prometheus), Op. 43, is a ballet composed in 1801 by Ludwig van Beethoven following the libretto of Salvatore Viganò. The ballet premiered on 28 March 1801 at the Burgtheater in Vienna and was given 28 performances. It is the only full length ballet by Beethoven. According to musicologist Lewis Lockwood, Beethoven’s music for this ballet is "easier and lighter than music for the concert hall…[I]t shows Beethoven exploiting instruments and coloristic orchestral effects that would never appear in his symphonies or serious dramatic overtures." Beethoven later based the fourth movement of his Eroica symphony and his Eroica Variations (piano) on the main theme of the last movement (Finale) of this ballet. The ballet requires the use of harp and basset-horn among the orchestral instruments. ^ “Ludwig Van Beethoven (1770–1827), The Creatures of Prometheus, Ballet Op. 43, Melbourne Symphony Orchestra, Michael Halasz”, back cover (1995). ^ a b Lockwood, Lewis. Beethoven: The Music and the Life, pp. 149-150 (W. W. Norton & Company, 2005). "Overture to The Creatures of Prometheus". The Kennedy Center. 30 September 2012. Retrieved 11 December 2013. Gabriela Lena Frank (born Berkeley, California, United States, September 1972) is an American pianist and composer of contemporary classical music. Gabriela Lena Frank's father is an American of Lithuanian Jewish heritage and her mother is Peruvian of Chinese descent. She grew up in Berkeley, California. Her parents met when her father was a Peace Corps volunteer in Peru in the 1960s. Frank received her bachelor's and master's degrees from Rice University and a Doctorate in Music Composition from the University of Michigan in 2001. She has studied composition with William Albright, Leslie Bassett, William Bolcom, Michael Daugherty, and Samuel Jones. Frank's work often draws on her multicultural background, especially her mother's Peruvian heritage. In many of her compositions, she elicits the sounds of Latin American instruments such as Peruvian pan flute or charango guitar, although the works are typically scored for Western classical instruments and ensembles such as the symphony orchestra or string quartet. She has said, "I think the music can be seen as a by-product of my always trying to figure out how Latina I am and how gringa I am." In recent years, compositional/philosophical links have been made to composers such as Béla Bartók, Benjamin Britten, and Chou Wen-chung. Frank's music has been commissioned and performed by the Kronos Quartet, pipa virtuoso Wu Man, San Francisco Symphony, Houston Symphony, Chanticleer Ensemble, the Chiara String Quartet, the Brentano Quartet, Yo Yo Ma and the Silk Road Project, the Marilyn Horne Foundation, guitarist Manuel Barrueco with the Cuarteto Latinoamericano, the King's Singers, directors of the Chamber Music Society of Lincoln Center Wu Han and David Finckel, soprano Dawn Upshaw and the St. Paul Chamber Orchestra, and others. She has received multiple commission from Carnegie Hall. Her piece Concertino Cusqueño was commissioned and premiered by the Philadelphia Orchestra in celebration of the start of that organization's newest conductor, Yannick Nézet-Séguin. Past performances include those by the Boston Symphony, the San Francisco Symphony, the Chicago Symphony, the Atlanta Symphony, the Baltimore Symphony, and the Los Angeles Philharmonic Green Umbrella series. She has an upcoming commissioned premiere with the Cleveland Symphony in May 2014 and another commissioned premiere with the Houston Symphony in September 2014. She has served as composer-in-residence with many institutions including the , the Fort Worth Symphony, the Indianapolis Symphony, the Aspen Music Festival, the Seattle Symphony, the Nashville Symphony, the San Francisco Chamber Orchestra, and the Annapolis Symphony Orchestra. Between 2009 and 2012, she served as the Creative Advisor to her hometown orchestra, the under the baton of frequent collaborator Joana Carneiro before stepping down to spend more time composing. Frank currently serves as composer-in-residence with the Detroit Symphony Orchestra under the baton of Leonard Slatkin, and the Houston Symphony under the baton of . She has been featured at many festivals around the world including Music@Menlo, Tanglewood Music Festival, and with the Chicago Chamber Players, among others. 2009 saw Frank receive her first Guggenheim Fellowship as well as a Latin Grammy Award for best Contemporary Classical Music Composition for Inca Dances (Tonar Label), which was written for guitarist Manuel Barrueco and the Cuarteto Latinoamericano. She was also the feature of her first PBS documentary entitled "Peregrinos" (produced by Emmy-winning producer Aric Hartvig) regarding her residency with the Indianapolis Symphony orchestra where, with an award from the Joyce Foundation, she composed a work inspired by the stories of Latino immigrants in Indianapolis. Gabriela Lena Frank is a member of the Silk Road Ensemble under the direction of cellist Yo Yo Ma. Her composition Ritmos Anchinos appears on the Silk Road Ensemble's album Off the Map (World Village & In a Circle Records, 2009). "Off the Map" was nominated for a 2011 Grammy for Best Classical Crossover Album. Also in 2011, Frank released a complete CD of her works, entitled "Hilos," on the Naxos label with the Nashville-based ALIAS Ensemble, featuring a new mixed quartet written expressly for ALIAS. In its first week of release, it broke into the Billboard's top 100 Classical Recordings and was subsequently awarded a rare "10/10" rating by Classics Today. "Hilos" was nominated for a 2012 Grammy Award in the category of Best Small Ensemble Performance on which Frank plays piano. It has received more than a dozen positive reviews. In 2012, Frank was sponsored by the US-Quito Embassy in Ecuador and small crowdsourced private donors through USA Artists to compose a new work for the Ecuadoran group La Orquesta de Instrumentos Andinos (Orchestra of Andean Instruments). The work, "Compadre Huashayo," is to be played entirely on indigenous instruments while drawing on a mix of modernist classical and traditional indigenous practices. Once again, PBS profiled Frank in a documentary, likewise entitled "Compadre Huashayo" that was premiered in fall 2013. In 2013, Frank received the Medal of Excellence from the Sphinx Organization for outstanding young Black and Latino leaders in classical music. She received her award in a ceremony at the Supreme Court in Washington, D.C., meeting Justices Sonia Sotomayor and Ruth Ginsburg. Later that year, she released another CD of her chamber works with on the Albany Records label. Frank is frequently performed by the Caminos del Inka collective under the direction of conductor Miguel Harth-Bedoya. She works closely with Pulitzer Prize-winning playwright Nilo Cruz in the creation of original new musical works for voice. Their first collaboration was a set of orchestra songs for Dawn Upshaw and the St. Paul Chamber Orchestra. Frank is also a Grammy-nominated pianist. She has recorded the complete piano works of Pulitzer Prize–winning composer Leslie Bassett on the Equilibrium label. Recent performances include those with current and former members of the Los Angeles Philharmonic, the San Francisco Symphony, the Orpheus Chamber Orchestra, , the , the , and the Boston Symphony Orchestra. Frank is a freelance composer who left her native San Francisco Bay Area in the fall of 2015 to start a farm with her husband in the town of Boonville, California in Mendocino County. In 2017, she founded her own school, the Gabriela Lena Frank Creative Academy of Music (www.glfcam.com) for emerging composers to work with renowned performers. She travels frequently throughout North and South America. She is also often a guest artist at universities and conservatories, giving performances, lectures, and lessons. She is a member of the prestigious roster of G. Schirmer, exclusively published and managed. ^ "Carnegie Hall Commissions". Carnegie Hall website. Carnegie Hall. Retrieved 2008-03-31. Clark, W. A. (2012). Latin American Impact on Contemporary Classical Music. In Moore, R. and W. A. Clark (Ed. ), Musics of Latin America. W. W. Norton & Company. Hayes, D. (2011). Gabriela Lena Frank. In M. Slayton (Ed. ), Women of influence in contemporary music: Nine American composers (pp. 85–140). Lanham, MD: Scarecrow Press, Inc.
Kelly, J. (2013). In her own words: conversations with composers in the United States. Champaign, IL: University of Illinois Press. Rückert-Lieder (Songs after Rückert) is a song cycle of five Lieder for voice and orchestra or piano by Gustav Mahler, based on poems written by Friedrich Rückert. The songs were first published in Sieben Lieder aus letzter Zeit (Seven Songs of Latter Days)). The first four songs were premiered on 29 January 1905 in Vienna, Mahler himself conducting, together with his Kindertotenlieder (also on poems by Rückert). The last song, Liebst du um Schönheit, was not orchestrated by Mahler himself but by Max Puttmann, an employee of the first publisher, after Mahler's death. The set of songs is not a cycle in the narrowest sense, because the Lieder are independent, connected only by the poetry and common themes. However, they were published together and most often have been performed together and come to be known as the Rückert-Lieder, although Mahler did set more texts of Rückert. Artists such as Dietrich Fischer-Dieskau and Kathleen Ferrier have chosen their own order of the Lieder. Universal Edition has published a score consisting only of the five Rückert settings. The size and constitution of the orchestra varies from song to song, but the instruments required for performance of the complete set are as follows: two flutes, two oboes, oboe d'amore, English horn, two clarinets, two bassoons, contrabassoon, four horns, two trumpets, three trombones, bass tuba, timpani, celesta, harp, piano and strings. the latter recorded by the ALEA Ensemble with the baritone Alexander Puhrer. ^ Mahler, Gustav (1913). Ruckert-Lieder (PDF). Leipzig: C.F. Kahnt Nachfolger. Retrieved 2 April 2018. "Beethoven's Fifth" redirects here. For the movie, see Beethoven's 5th (film). For Beethoven's 5th piano concerto, see Piano Concerto No. 5 (Beethoven). The Symphony No. 5 in C minor of Ludwig van Beethoven, Op. 67, was written between 1804 and 1808. It is one of the best-known compositions in classical music, and one of the most frequently played symphonies. 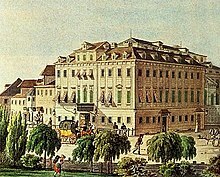 First performed in Vienna's Theater an der Wien in 1808, the work achieved its prodigious reputation soon afterward. E. T. A. Hoffmann described the symphony as "one of the most important works of the time". As is typical of symphonies in the classical period, Beethoven's Fifth Symphony is in four movements. The symphony, and the four-note opening motif in particular, are known worldwide, with the motif appearing frequently in popular culture, from disco versions to rock and roll covers, to uses in film and television. Like Beethoven's Eroica (heroic) and Pastorale (rural), Symphony No. 5 was given an explicit name, besides the numbering. It became popular under "Schicksals-Sinfonie" (symphony of destiny), and the famous five bar theme was coined "Schicksals-Motiv". This name is also used in translations. The Fifth Symphony had a long development process, as Beethoven worked out the musical ideas for the work. The first "sketches" (rough drafts of melodies and other musical ideas) date from 1804 following the completion of the Third Symphony. 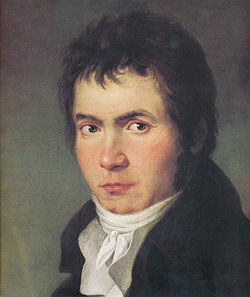 However, Beethoven repeatedly interrupted his work on the Fifth to prepare other compositions, including the first version of Fidelio, the Appassionata piano sonata, the three Razumovsky string quartets, the Violin Concerto, the Fourth Piano Concerto, the Fourth Symphony, and the Mass in C. The final preparation of the Fifth Symphony, which took place in 1807–1808, was carried out in parallel with the Sixth Symphony, which premiered at the same concert. Beethoven was in his mid-thirties during this time; his personal life was troubled by increasing deafness. In the world at large, the period was marked by the Napoleonic Wars, political turmoil in Austria, and the occupation of Vienna by Napoleon's troops in 1805. The symphony was written at his lodgings at the Pasqualati House in Vienna. The final movement quotes from a revolutionary song by Claude Joseph Rouget de Lisle. Radiant beams shoot through this region's deep night, and we become aware of gigantic shadows which, rocking back and forth, close in on us and destroy everything within us except the pain of endless longing—a longing in which every pleasure that rose up in jubilant tones sinks and succumbs, and only through this pain, which, while consuming but not destroying love, hope, and joy, tries to burst our breasts with full-voiced harmonies of all the passions, we live on and are captivated beholders of the spirits. The symphony soon acquired its status as a central item in the orchestral repertoire. It was played in the inaugural concerts of the New York Philharmonic on 7 December 1842, and the [US] National Symphony Orchestra on 2 November 1931. It was first recorded by the Odeon Orchestra under Friedrich Kark in 1910. The First Movement (as performed by the Philharmonia Orchestra) was featured on the Voyager Golden Record, a phonograph record containing a broad sample of the images, common sounds, languages, and music of Earth, sent into outer space aboard the Voyager probes in 1977. Groundbreaking in terms of both its technical and its emotional impact, the Fifth has had a large influence on composers and music critics, and inspired work by such composers as Brahms, Tchaikovsky (his 4th Symphony in particular), Bruckner, Mahler, and Berlioz. Since the Second World War, it has sometimes been referred to as the "Victory Symphony". "V" is coincidentally also the Roman numeral character for the number five and the phrase "V for Victory" became well known as a campaign of the Allies of World War II. That Beethoven's Victory Symphony happened to be his Fifth (or vice versa) is coincidence. Some thirty years after this piece was written, the rhythm of the opening phrase – "dit-dit-dit-dah" – was used for the letter "V" in Morse code, though this is probably also coincidental. During the Second World War, the BBC prefaced its broadcasts to Europe with those four notes, played on drums. The symphony is scored for the following orchestra. The first movement opens with the four-note motif discussed above, one of the most famous motifs in Western music. There is considerable debate among conductors as to the manner of playing the four opening bars. Some conductors take it in strict allegro tempo; others take the liberty of a weighty treatment, playing the motif in a much slower and more stately tempo; yet others take the motif molto ritardando (a pronounced slowing through each four-note phrase), arguing that the fermata over the fourth note justifies this. Some critics and musicians consider it crucial to convey the spirit of [pause]and-two-and one, as written, and consider the more common one-two-three-four to be misleading. Critic Michael Steinberg stated that with the "ta-ta-ta-Taaa", "Beethoven begins with eight notes." He points out that "They rhyme, four plus four, and each group of four consists of three quick notes plus one that is lower and much longer (in fact unmeasured)." As well, the "...space between the two rhyming groups is minimal, about one-seventh of a second if we go by Beethoven's metronome mark". In addition, "Beethoven clarifies the shape by lengthening the second of the long notes. This lengthening, which was an afterthought, is tantamount to writing a stronger punctuation mark. As the music progresses, we can hear in the melody of the second theme, for example (or later, in the pairs of antiphonal chords of woodwinds and strings (i.e. chords that alternate between woodwind and string instruments)), that the constantly invoked connection between the two four-note units is crucial to the movement." Steinberg states that the "...source of Beethoven's unparalleled energy...is in his writing long sentences and broad paragraphs whose surfaces are articulated with exciting activity." Indeed, "...the double "ta-ta-ta-Taaa" is an open-ended beginning, not a closed and self-sufficient unit (Misunderstanding of this opening was nurtured by a nineteenth-century performance tradition in which the first five measures were read as a slow, portentous exordium, the main tempo being attacked only after the second hold.)" He states that the "opening [is] so dramatic" due to the "violence of the contrast between the urgency in the eighth notes and the ominous freezing of motion in the unmeasured long notes." He states that "...the music starts with a wild outburst of energy but immediately crashes into a wall." Steinberg states that "...[s]econds later, Beethoven jolts us with another such sudden halt. The music draws up to a half-cadence on a G major chord, short and crisp in the whole orchestra, except for the first violins, who hang on to their high G for an unmeasured length of time. Forward motion resumes with a relentless pounding of eighth notes." The first movement is in the traditional sonata form that Beethoven inherited from his classical predecessors, Haydn and Mozart (in which the main ideas that are introduced in the first few pages undergo elaborate development through many keys, with a dramatic return to the opening section—the recapitulation—about three-quarters of the way through). It starts out with two dramatic fortissimo phrases, the famous motif, commanding the listener's attention. Following the first four bars, Beethoven uses imitations and sequences to expand the theme, these pithy imitations tumbling over each other with such rhythmic regularity that they appear to form a single, flowing melody. Shortly after, a very short fortissimo bridge, played by the horns, takes place before a second theme is introduced. This second theme is in E♭ major, the relative major, and it is more lyrical, written piano and featuring the four-note motif in the string accompaniment. The codetta is again based on the four-note motif. The development section follows, including the bridge. During the recapitulation, there is a brief solo passage for oboe in quasi-improvisatory style, and the movement ends with a massive coda. The second movement, in A♭ major, the subdominant key of C minor's relative key (E♭ major), is a lyrical work in double variation form, which means that two themes are presented and varied in alternation. Following the variations there is a long coda. The opening theme is answered by a contrasting theme played by the winds, and this sequence is repeated. Then the horns loudly announce the main theme of the movement, and the music proceeds from there. The trio section is in C major and is written in a contrapuntal texture. When the scherzo returns for the final time, it is performed by the strings pizzicato and very quietly. "The scherzo offers contrasts that are somewhat similar to those of the slow movement [Andante con moto] in that they derive from extreme difference in character between scherzo and trio ... The Scherzo then contrasts this figure with the famous 'motto' (3 + 1) from the first movement, which gradually takes command of the whole movement." The third movement is also notable for its transition to the fourth movement, widely considered one of the greatest musical transitions of all time. Many assert that every minor piece must end in the minor. Nego! ...Joy follows sorrow, sunshine—rain. The triumphant and exhilarating finale is written in an unusual variant of sonata form: at the end of the development section, the music halts on a dominant cadence, played fortissimo, and the music continues after a pause with a quiet reprise of the "horn theme" of the scherzo movement. The recapitulation is then introduced by a crescendo coming out of the last bars of the interpolated scherzo section, just as the same music was introduced at the opening of the movement. The interruption of the finale with material from the third "dance" movement was pioneered by Haydn, who had done the same in his Symphony No. 46 in B, from 1772. It is unknown whether Beethoven was familiar with this work or not. The Fifth Symphony finale includes a very long coda, in which the main themes of the movement are played in temporally compressed form. Towards the end the tempo is increased to presto. The symphony ends with 29 bars of C major chords, played fortissimo. In The Classical Style, Charles Rosen suggests that this ending reflects Beethoven's sense of Classical proportions: the "unbelievably long" pure C major cadence is needed "to ground the extreme tension of [this] immense work." It has been shown that this long chord sequence was a pattern that Beethoven borrowed from the Italian composer Luigi Cherubini, whom Beethoven “esteemed the most” among his contemporary musicians. Spending much of his life in France, Cherubini employed this pattern consistently to close his overtures, which Beethoven knew well. The ending of his famous symphony repeats almost note by note and pause by pause the conclusion of Cherubini’s overture to his opera Eliza, composed in 1794 and presented in Vienna in 1803. The composer himself provided the key to these depths when one day, in this author's presence, he pointed to the beginning of the first movement and expressed in these words the fundamental idea of his work: "Thus Fate knocks at the door!" Schindler's testimony concerning any point of Beethoven's life is disparaged by experts (he is believed to have forged entries in Beethoven's so-called "conversation books", the books in which the deaf Beethoven got others to write their side of conversations with him). Moreover, it is often commented that Schindler offered a highly romanticized view of the composer. There is another tale concerning the same motif; the version given here is from Antony Hopkins's description of the symphony. Carl Czerny (Beethoven's pupil, who premiered the "Emperor" Concerto in Vienna) claimed that "the little pattern of notes had come to [Beethoven] from a yellow-hammer's song, heard as he walked in the Prater-park in Vienna." Hopkins further remarks that "given the choice between a yellow-hammer and Fate-at-the-door, the public has preferred the more dramatic myth, though Czerny's account is too unlikely to have been invented." In his Omnibus television lecture series in 1954, Leonard Bernstein likened the Fate Motif to the four note coda common to classical symphonies. These notes would terminate the classical symphony as a musical coda, but for Beethoven they become a motif repeating throughout the work for a very different and dramatic effect, he says. Evaluations of these interpretations tend to be skeptical. "The popular legend that Beethoven intended this grand exordium of the symphony to suggest 'Fate Knocking at the gate' is apocryphal; Beethoven's pupil, Ferdinand Ries, was really author of this would-be poetic exegesis, which Beethoven received very sarcastically when Ries imparted it to him." Elizabeth Schwarm Glesner remarks that "Beethoven had been known to say nearly anything to relieve himself of questioning pests"; this might be taken to impugn both tales. It is commonly asserted that the opening four-note rhythmic motif (short-short-short-long; see above) is repeated throughout the symphony, unifying it. "It is a rhythmic pattern (dit-dit-dit-dot*) that makes its appearance in each of the other three movements and thus contributes to the overall unity of the symphony" (Doug Briscoe); "a single motif that unifies the entire work" (Peter Gutmann); "the key motif of the entire symphony"; "the rhythm of the famous opening figure ... recurs at crucial points in later movements" (Richard Bratby). The New Grove encyclopedia cautiously endorses this view, reporting that "[t]he famous opening motif is to be heard in almost every bar of the first movement—and, allowing for modifications, in the other movements." On the other hand, some commentators are unimpressed with these resemblances and consider them to be accidental. Antony Hopkins, discussing the theme in the scherzo, says "no musician with an ounce of feeling could confuse [the two rhythms]", explaining that the scherzo rhythm begins on a strong musical beat whereas the first-movement theme begins on a weak one. Donald Tovey pours scorn on the idea that a rhythmic motif unifies the symphony: "This profound discovery was supposed to reveal an unsuspected unity in the work, but it does not seem to have been carried far enough." Applied consistently, he continues, the same approach would lead to the conclusion that many other works by Beethoven are also "unified" with this symphony, as the motif appears in the "Appassionata" piano sonata, the Fourth Piano Concerto ( listen (help·info)), and in the String Quartet, Op. 74. Tovey concludes, "the simple truth is that Beethoven could not do without just such purely rhythmic figures at this stage of his art." To Tovey's objection can be added the prominence of the short-short-short-long rhythmic figure in earlier works by Beethoven's older Classical contemporaries Haydn and Mozart. To give just two examples, it is found in Haydn's "Miracle" Symphony, No. 96 ( listen (help·info)) and in Mozart's Piano Concerto No. 25, K. 503 ( listen (help·info)). Such examples show that "short-short-short-long" rhythms were a regular part of the musical language of the composers of Beethoven's day. It seems likely that whether or not Beethoven deliberately, or unconsciously, wove a single rhythmic motif through the Fifth Symphony will (in Hopkins's words) "remain eternally open to debate." Folia is a dance form with a distinctive rhythm and harmony, which was used by many composers from the Renaissance well into the 19th and even 20th centuries, often in the context of a theme and variations. It was used by Beethoven in his Fifth Symphony in the harmony midway through the slow movement (bars 166–177). Although some recent sources mention that the fragment of the Folia theme in Beethoven's symphony was detected only in the 1990s, Reed J. Hoyt analyzed some Folia-aspects in the oeuvre of Beethoven already in 1982 in his "Letter to the Editor", in the journal College Music Symposium 21, where he draws attention to the existence of complex archetypal patterns and their relationship. It is a common misconception that the last movement of Beethoven's Fifth is the first time the trombone and the piccolo were used in a concert symphony. In 1807, the Swedish composer Joachim Nicolas Eggert had specified trombones for his Symphony in E♭ major, and examples of earlier symphonies with a part for piccolo abound, including Michael Haydn's Symphony No. 19 in C major, composed in August 1773. In the autograph score (that is, the original version from Beethoven's hand), the third movement contains a repeat mark: when the scherzo and trio sections have both been played through, the performers are directed to return to the very beginning and play these two sections again. Then comes a third rendering of the scherzo, this time notated differently for pizzicato strings and transitioning directly to the finale (see description above). Most modern printed editions of the score do not render this repeat mark; and indeed most performances of the symphony render the movement as ABA′ (where A = scherzo, B = trio, and A′ = modified scherzo), in contrast to the ABABA′ of the autograph score. The repeat mark in the autograph is unlikely to be simply an error on the composer's part. The ABABA′ scheme for scherzi appears elsewhere in Beethoven, in the Bagatelle for solo piano, Op. 33, No. 7 (1802), and in the Fourth, Sixth, and Seventh Symphonies. However, it is possible that for the Fifth Symphony, Beethoven originally preferred ABABA′, but changed his mind in the course of publication in favor of ABA′. Since Beethoven's day, published editions of the symphony have always printed ABA′. However, in 1978 an edition specifying ABABA′ was prepared by [de] and published by Peters. In 1999, yet another edition, by Jonathan Del Mar, was published by Bärenreiter which advocates a return to ABA′. In the accompanying book of commentary, Del Mar defends in depth the view that ABA′ represents Beethoven's final intention; in other words, that conventional wisdom was right all along. In concert performances, ABA′ prevailed until the 2000s. However, since the appearance of the Gülke edition, conductors have felt more free to exercise their own choice. Performances with ABABA′ seem to be particularly favored by conductors who specialize in authentic performance or historically informed performance (that is, using instruments of the kind employed in Beethoven's day and playing techniques of the period). These include Caroline Brown, Christopher Hogwood, John Eliot Gardiner, and Nikolaus Harnoncourt. ABABA′ performances on modern instruments have also been recorded by the New Philharmonia Orchestra under Pierre Boulez, the Tonhalle Orchester Zürich under David Zinman, and the Berlin Philharmonic Orchestra under Claudio Abbado. this ... presented a problem to Beethoven, for the horns [of his day], severely limited in the notes they could actually play before the invention of valves, were unable to play the phrase in the 'new' key of C major—at least not without stopping the bell with the hand and thus muffling the tone. Beethoven therefore had to give the theme to a pair of bassoons, who, high in their compass, were bound to seem a less than adequate substitute. In modern performances the heroic implications of the original thought are regarded as more worthy of preservation than the secondary matter of scoring; the phrase is invariably played by horns, to whose mechanical abilities it can now safely be trusted. In fact, even before Hopkins wrote this passage (1981), some conductors had experimented with preserving Beethoven's original scoring for bassoons. This can be heard on many performances including those conducted by Caroline Brown mentioned in the preceding section as well as in a recent recording by Simon Rattle with the Vienna Philharmonic. Although horns capable of playing the passage in C major were developed not long after the premiere of the Fifth Symphony (they were developed in 1814), it is not known whether Beethoven would have wanted to substitute modern horns, or keep the bassoons, in the crucial passage. There are strong arguments in favor of keeping the original scoring even when modern valve horns are available. The structure of the movement posits a programmatic alteration of light and darkness, represented by major and minor. Within this framework, the topically heroic transitional theme dispels the darkness of the minor first theme group and ushers in the major second theme group. However, in the development section, Beethoven systematically fragments and dismembers this heroic theme in bars 180–210. Thus he may have rescored its return in the recapitulation for a weaker sound to foreshadow the essential expositional closure in minor. Moreover, the horns used in the fourth movement are natural horns in C, which can easily play this passage. If Beethoven had wanted the second theme in the horns, he could have had the horns resting for the previous bars to give them time to switch instruments, and then written "muta in c," similar to his "muta in f" instruction in measure 412 of the first movement of Symphony No. 3. The edition by Jonathan Del Mar mentioned above was published as follows: Ludwig van Beethoven. Symphonies 1–9. Urtext. Kassel: Bärenreiter, 1996–2000, ISMN M-006-50054-3. An inexpensive version of the score has been issued by Dover Publications. This is a 1989 reprint of an old edition (Braunschweig: Henry Litolff, no date). A similar "Unmei" reference shows up in Japanese live action series "Kamen Rider Ghost". The titular character's Beethoven Soul form, when activated, causes his transformation device to chant "Kyokumei! Unmei! Jajajajan~" (Melody! Destiny! Jajajajan~), with the "Jajajajan~" part being the 4 beginning notes of Symphony No. 5. Walter Murphy adapted the first movement under the title "A Fifth of Beethoven" as a disco instrumental in 1976. It was featured in the 1977 movie Saturday Night Fever. The 1981 single "Hooked on Classics" from the album of the same name, by Louis Clark and the Royal Philharmonic Orchestra, includes a portion of the Fifth. The video game Dragon's Lair II: Time Warp features the symphony in Dirk's encounter with Beethoven. Fantasia 2000 features a shortened version of the first movement as its opening sequence. Wolfgang's 5th Symphony by Wolfgang Gartner, an Electro House adaptation. The opening sequence of "Before the Flood" a 2015 episode of the UK science fiction series Doctor Who, features discussion of Beethoven's 5th in the context of the bootstrap paradox. To punctuate the discussion, the episode begins and ends with actor Peter Capaldi playing the symphony's opening notes on electric guitar; in the opening of the episode, the notes lead into a variation of the "Doctor Who theme music". ^ Schauffler, Robert Haven (1933). Beethoven: The Man Who Freed Music. Garden City, New York: Doubleday, Doran, & Company. p. 211. ^ a b c d e Hopkins, Antony (1977). The Nine Symphonies of Beethoven. Scolar Press. ISBN 1-85928-246-6. ^ "Beethoven's deafness". lvbeethoven.com. Retrieved 31 August 2015. ^ Kinderman, William (1995). Beethoven. Berkeley: University of California Press. p. 122. ISBN 0-520-08796-8. ^ Parsons, Anthony (1990). "Symphonic birth-pangs of the trombone". British Trombone Society. Retrieved 31 August 2015. ^ Robbins Landon, H. C. (1992). Beethoven: His Life, Work, and World. New York: Thames and Hudson. p. 149. ^ "Recension: Sinfonie ... composée et dediée etc. par Louis van Beethoven. à Leipsic, chez Breitkopf et Härtel, Oeuvre 67. No. 5. des Sinfonies", Allgemeine Musikalische Zeitung 12, nos. 40 and 41 (4 & 11 July 1810): cols. 630–42 and 652–59. Citation in col. 633. ^ Published anonymously, "Beethovens Instrumental-Musik, Zeitung für die elegante Welt, nos. 245–47 (9, 10, and 11 December 1813): cols. 1953–57, 1964–67, and 1973–75. [page needed] Also published anonymously as part of Hoffmann's collection titled Fantasiestücke in Callots Manier, 4 vols. Bamberg, 1814. English edition, as Ernst Theodor Amadeus Hoffmann, Fantasy Pieces in Callot's Manner: Pages from the Diary of a Traveling Romantic, translated by Joseph M Hayse. Schenectady: Union College Press, 1996;ISBN 0-912756-28-4. ^ "Golden Record Music List". NASA. Retrieved 26 July 2012. ^ Moss, Charles K. "Ludwig van Beethoven: A Musical Titan". Archived from the original on 22 December 2007. .
^ Freed, Richard. "Symphony No. 5 in C minor, Op. 67". Archived from the original on 6 September 2005. ^ Rushton, Julian. The Music of Berlioz. p. 244. ^ "London Symphony Orchestra, conducted by Josef Krips – The Victory Symphony (Symphony No. 5 In C major[sic], Op. 67)". Discogs. 2015. Retrieved 31 August 2015. ^ Code designations for Morse code letters were decided based on a table of letter frequency by Alfred Vail. ^ "V-Campaign". A World of Wireless: Virtual Radiomuseum. Archived from the original on 12 March 2005. Retrieved 31 August 2015. ^ Karpf, Jason (18 July 2013). "V for Victory and Viral". The Funky Adjunct. Retrieved 31 August 2015. ^ MacDonald, James (20 July 1941). "British Open 'V' Nerve War; Churchill Spurs Resistance". The New York Times. Retrieved 31 August 2015. ^ a b Scherman, Thomas K. & Louis, Biancolli (1973). The Beethoven Companion. Garden City, New York: Double & Company. p. 570. ^ Steinberg, Michael (1998). The Symphony. Oxford. p. 24. ^ Scherman, Thomas K. & Biancolli, Louis (1973). The Beethoven Companion. Garden City, New York: Double & Company. p. 572. ^ Lockwood, Lewis. Beethoven: The Music and the Life. New York: W.W. Norton & Company. p. 223. ISBN 0-393-05081-5. ^ Kinderman, William (2009). Beethoven (2nd ed.). New York: Oxford University Press. p. 150. ^ Lockwood, Lewis. Beethoven: The Music and the Life. New York: W.W. Norton & Company. p. 224. ISBN 0-393-05081-5. ^ Kerst, Friedrich; Krehbiel, Henry Edward, eds. (2008). Beethoven: The Man and the Artist, as Revealed in His Own Words. Translated by Henry Edward Krehbiel. Boston: IndyPublishing. p. 15. ^ Rosen, Charles (1997). The Classical Style (2nd ed.). New York: Norton. p. 72. ^ Romano, Stefan (Winter 2009). "Ending the Fifth". The Beethoven Journal. 24 (2): 56–71. ^ Nottebohm, Gustav (1887). 'Zweite Beethoviana. Leipzig: C. F. Peters. p. 531. ^ Jolly, Constance (1966). Beethoven as I Knew Him. London: Faber and Faber. As translated from Schindler (1860). Biographie von Ludwig van Beethoven. ^ Cooper, Barry (1991). The Beethoven Compendium. Ann Arbor, Michigan: Borders Press. p. 52. ISBN 0-681-07558-9. ^ Omnibus – Leonard Bernstein Beethoven's Fifth Excerpt. youtube.com. Archived from the original on 9 June 2015. Retrieved 31 August 2015. ^ "Ludwig van Beethoven—Symphony No. 5, Op. 67". Classical Music Pages. Archived from the original on 6 July 2009. ^ Wyatt, Henry. "Mason Gross Presents—Program Notes: 14 June 2003". Mason Gross School of Arts. Archived from the original on 1 September 2006. ^ Rosen, Charles (2002). Beethoven's Piano Sonatas: A Short Companion. New Haven: Yale University Press. p. 134. ^ a b Briscoe, Doug. "Program Notes: Celebrating Harry: Orchestral Favorites Honoring the Late Harry Ellis Dickson". Boston Classic Orchestra. Archived from the original on 17 July 2012. ^ Gutmann, Peter. "Ludwig Van Beethoven: Fifth Symphony". Classical Notes. ^ "Beethoven's Symphony No. 5. The Destiny Symphony". All About Beethoven. ^ Bratby, Richard. "Symphony No. 5". Archived from the original on 31 August 2005. ^ Tovey, Donald Francis (1935). Essays in Musical Analysis, Volume 1: Symphonies. London: Oxford University Press. ^ "What is La Folia?". folias.nl. 2015. Retrieved 31 August 2015. ^ "Bar 166". folias.nl. 2008. Retrieved 31 August 2015. ^ "Which versions of La Folia have been written down, transcribed or recorded?". folias.nl. Retrieved 31 August 2015. ^ Kallai, Avishai. "Revert to Eggert". Retrieved 28 April 2006. ^ Del Mar, Jonathan, ed. (1999). Ludwig van Beethoven: Symphony No. 5 in C minor. Kassel: Bärenreiter. ^ Del Mar, Jonathan (July – December 1999). "Jonathan Del Mar, New Urtext Edition: Beethoven Symphonies 1–9". British Academy Review. Retrieved 23 February 2008. ^ Del Mar, Jonathan, ed. (1999). Critical Commentary. Ludwig van Beethoven: Symphony No. 5 in C minor. Kassel: Bärenreiter. ^ Ericson, John. "E. C. Lewy and Beethoven's Symphony No. 9". ^ Symphonies Nos. 5, 6, and 7 in Full Score (Ludwig van Beethoven). New York: Dover Publications.ISBN 0-486-26034-8. ^ "Wolfgang Gartner — Wolfgang's 5th Symphony (Original Mix) [Ultra]". Beatport Pro. Retrieved 31 August 2015. ^ Stamm, Michael (June 2012). "Beethoven in America". The Journal of American History. 99 (1): 321–322. Retrieved 31 August 2015. Guerrieri, Matthew (2012). The First Four Notes: Beethoven’s Fifth and the Human Imagination. New York: Alfred A. Knopf. ISBN 9780307593283. Program notes for a performance by the National Symphony Orchestra, Washington, DC. Program notes for a performance & lecture by Jeffrey Kahane and the Los Angeles Chamber Orchestra. Symphony No. 5 is available in PDF format created from MuseData.